Talking about management of the files is one of the critical aspects of the application. If you don't know the file formats or a source file of a certain files you cannot go on with your application of the Corel Draw. Corel draw is a graphical application that frequently define of the internet as victor editor, which can perform editing of bitmap image, photo paint, and other graphical application related programs. This is an advance application of the windows paint that commonly neglected or not use by the users of the Microsoft Windows Operating System in all versions. This can be access using the programs/ accessories/ or all programs of the Windows 7. You can use this windows paint for your casual art then edit it in Corel Draw. The problem is how to import this files in the Corel Draw template. 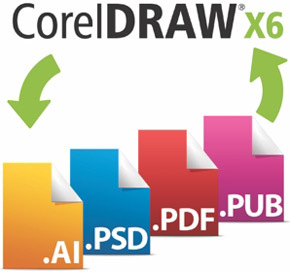 Corel Draw's native file formats under its application is called .cdr its no longer new that this format cannot be integrated to many applications right away without proper file format conversions. If you like to save to open your file to other drawing applications like Illustrator, you must choose AI format under the file type drop-down bar provided in the save dialogue box. Other formats are also supported. You must be aware also that Corel Draw doesn't support backward compatibility. Meaning, that files created in newer versions can’t be opened in older ones. However, we have this options from the save dialogue box that allows you save the file in different versions. Good news is that, its provides thumbnails display for the pictures and can import two or more files at the same time. In exporting files of the Corel Draw, it is very clear and possible, this features allow you to save your files into another file type, example: .jpeg, .gif, .bmp. Exporting file does not affect the original .cdr format. And choose file format under file type drop down bar. Note: In exporting objects choose form the drawing area, select an object you wish to export and go to File then Export. In printing Corel Draw files doesn’t made any difference from other applications. Except that it has some special features that you’d find useful such as tiling pages and object imposition. Corel Draw also provides essential tools for image-setting. Repositioning of objects in the Preview Window can be made possible of the Corel Draw before or during printouts. There are many firms for seo services in hyderabad which can help promote websites and blogs like this with great content. It helps in manifold increase of the traffic to the blog/website.